I’ve never really liked mayonnaise, and I don’t know why. I always chose mustard on sandwiches instead of mayo and opted for non-mayo pasta salads over mayo-heavy macaroni salad. I could just tolerate it in things like chicken salad if the mayo was light. So when I cut out eggs, I had a great excuse to cut out mayo: allergies. But because I also had to cut out things like yogurt, cottage cheese and other cheeses, I struggled with appropriate protein sources for brown-bag lunches. Enter hummus. A basic hummus recipe includes chickpeas, tahini (sesame seed paste — it kind of tastes like sunflower seed butter), olive oil, garlic and lemon juice. A typical 2-tablespoon serving will give you about 60 calories (give or take, depending on the variety of hummus), about 5 grams of good-for-you fat (again, give or take) from the olive oil and tahini, and 2 grams of protein. I discovered that while hummus on its own isn’t the most efficient protein source, it’s a great way to facilitate protein and veggies. First, I found hummus is a great spread for wraps. It’s not very unique, I know — numerous restaurants offer Mediterranean wraps made with hummus — but it’s so convenient. Just find a gluten-free wrap you like (or a whole-grain wrap, if you’re not GF), spread your favorite hummus on it, pile it with meats and/or veggies, and you’re good to go. You get a little more protein and a lot more flavor than mayo, which generally has zero protein for the same — or more — calories than hummus. Again, I know it’s not very creative, but hummus makes an amazing dip for crudités. It’s a vegan (and, in my case, allergy-friendly) alternative to traditional veggie dips made with sour cream or cream cheese. I love hummus with snow peas or sugar snap peas, carrot sticks and even raw broccoli — which I usually hate raw. Finally, one of my favorite ways to use hummus is as a replacement for mayo in chicken salad. This, I think, is a little bit more original than my previous examples, but I don’t know why everyone isn’t doing it. I use leftover baked chicken breast or bake a whole bunch of chicken breast and shred it up, or I use canned chicken if I’m lazy. Then I add a bunch of chopped-up veggies. And stir in as much hummus as you’d like. (I often end up using a lot of hummus!) Eat the salad by itself, on your favorite bread or on a bed of greens. 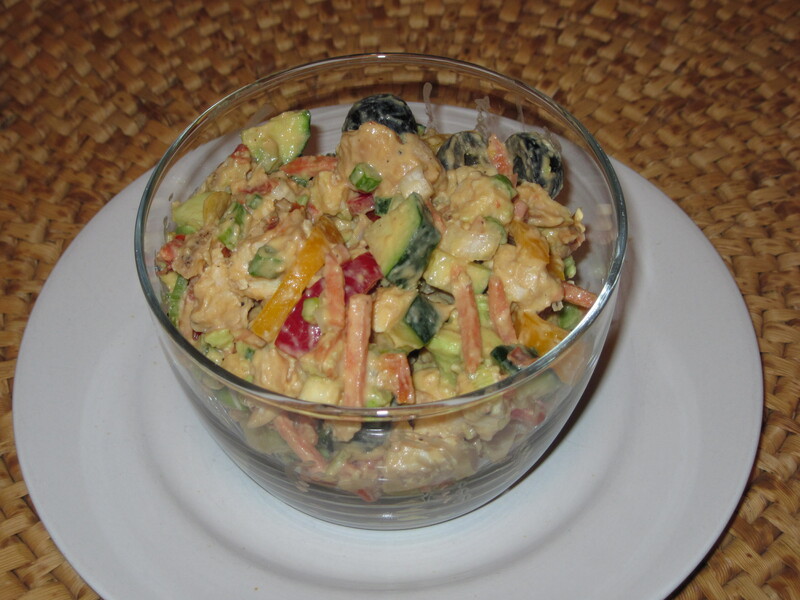 In the chicken salad pictured above, there are bell peppers, zucchini, peas, black olives and diced avocado. So that one’s a really mixed bag. But the varieties of chicken salad you can make are limited only by your imagination — and the veggies and variety of hummus in your fridge. Find a basic hummus with little or no garlic and add chopped celery, onions, grapes, apples and/or walnuts for a more traditional Waldorf-style chicken salad. A red pepper hummus goes great with Mediterranean fare like bell peppers, olives, zucchini or artichokes. One of the great thing about hummus — and why it works so well in all the aforementioned uses — is it comes in so many flavors. If you go with store-bought hummus, you have options as interesting as spinach and artichoke or “spicy yellow lentil hummus with sunflower seeds and apricot” — seriously, that’s what I’m eating right now. And they’re not kidding when they say “spicy.” If you make your own hummus, you can control exactly what goes in it, it’s probably more cost-effective, and you can make up your own recipes. Again, you’re limited only by your imagination.